Although spring may only just be upon us, there’s no time like the present to start preparing your skin for the warmer months. When the weather is milder, many people like to cut back on their use of makeup, as it can feel as though it is suffocating the skin and can start to slide off when the temperature rises. Giving your skin a break from heavy foundations and powders is great for the skin. However, the thought of going bare faced can strike the fear of God in many people! If you don’t feel confident about your skin, the chances are that you won’t feel confident in yourself either, and this leads to many women sticking with their safety blanket and ploughing through the winter months with oily and greasy skin. This doesn’t have to be the case though, and if you start to really look after your skin now, when the sun starts to shine your skin won’t need to rely on a heavy base. If your skin has suffered after the harsh winter, before you look at your daily skincare requirements, you need to give your skin a little TLC. 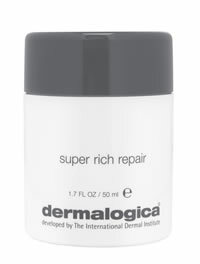 Dermalogica Super Rich Repair cream is perfect for intensely moisturising and repairing dry and damaged skin, and provides the perfect platform to launch your spring skin care regime. Go for bare faced chic this spring and give your skin some much needed breathing space.